Netflix (NFLX - Get Report) continue to power higher, with shares already up more than 38% this year. But here are three big reasons to avoid the stock going forward. Netflix was years ahead of its peers in recognizing the opportunity and to go about disrupting the incumbents. Netflix was both agile and aggressive, positioning itself as the go-to service provider and garnering massing market share at a rapid clip. However, as it stands right now, shareholders are not giving enough consideration to Netflix's tech competitors, such as Apple (AAPL - Get Report) and Disney (DIS - Get Report) which are both about to launch their brand new to the market offerings. This year is set to be the start of a massive showdown in this sector, with giant rivals focused on gaining market share. Furthermore, analysts, investors and general market pundits are all keenly aware of Apple's March 25 "it's show time" event, with Wall Street attempting to judge just how fierce Apple's foray into streaming content will actually be. One way or another, Netflix is going to struggle to retain market share in 2019. Netflix's has highlighted to investors that it will burn through $3 billion of free cash flow in 2019, yet investors appear unperturbed. The more difficult question investors should be asking is, how many years will it be before Netflix's starts to generate any positive free cash flow? 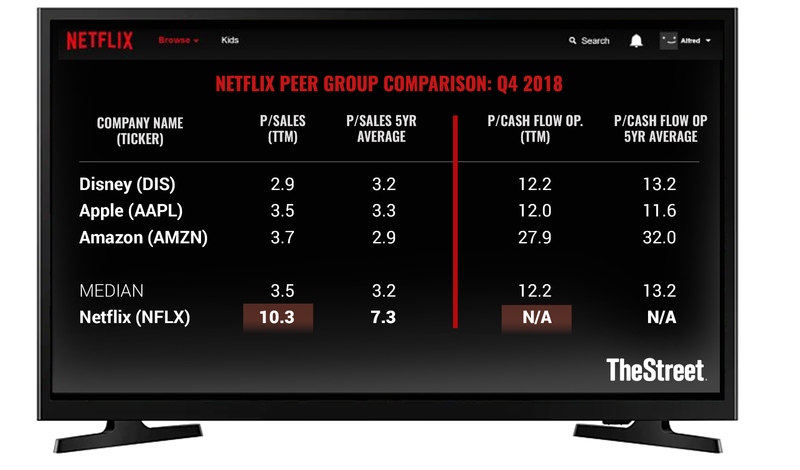 And then, the most contentious question of all that needs to be asked is, at which point does Netflix's free cash flow start to support its present valuation? Over the past three years, Netflix's revenues have increased by nearly 80%, a figure that sounds terrific. However, when we consider that Netflix's long-term debt has soared by 300% over the same time frame, it should at least raise eyebrows. Consequently, it should not be surprising that while Netflix's interest expense in 2016 accounted for less than 1.7% of its total revenue, it finished 2018 at 2.7%. In conclusion, Netflix's growth rate is struggling to keep up with tje pace of Netflix's soaring debt load. As the table above shows, Netflix is the only company in its peer group that is trading at such a large high price-to-sales ratio. Even shares of Amazon (AMZN - Get Report) , which many have argued are in bubble territory, is much more reasonably valued than Netflix. As noted, Netflix is set to have an extremely challenging few years ahead as it loses its oligopoly and its market becomes increasingly fragmented. Moreover, many Marvel fans, who might not typically subscribe to Disney's platform, may find themselves unsubscribing from Netflix and opting for Disney's platform, once Netflix loses all its rights to Disney's movies based on Marvel characters. Lastly, while some people might have the means to subscribe to more than one streaming platform, the rest of the world may not. And viewers may find that they are more likely to chose a platform which suits their viewing appetite based on price, rather than what original high-quality shows may be available. Going forward, viewers will have more choice of content than at any time before. One thing left unmentioned is that Netflix's streaming content obligations presently stand at around $20 billion. Many bullish investors have argued that these obligations can be canceled under certain conditions. However, if a positive assessment is reliant on Netflix being able to cancel some of its contractual obligations, I would argue that at that point a collapse in Netflix's house of cards would be imminent. Apple, Disney and Amazon are holdings in Jim Cramer's Action Alerts PLUS Charitable Trust Portfolio. Want to be alerted before Cramer buys or sells AAPL, DIS or AMZN? Learn more now.